April 29, 2017, 10:02 p.m. The ship/shore access must be given a final check by C/O prior allowing the personnel movement, if there is any doubt please discuss with shore personnel e.g. Pilot/Loading Master/Terminal Supervisor etc. It should be recorded in SSSCL. Side rail man rope should be at least 18 mm dia and preferably manila rope unless the gangway has specifically designed rope is available. The accommodation/MOT ladder shall be used within the operating range of up to 30 deg from horizontal, kindly have a stencil for max angle on MOT ladder itself. A lifebuoy and heaving line shall be placed near the gangway/access at all times. Safety net should be properly rigged while using accommodation and MOT ladder. The walking surface on the ladders should be non-slippery and must provide proper grip. The portable stanchion height shall be appropriate and in the range of 85-90 cm. Failure to arrange ship/shore access in a proper way may lead to serious consequences. One of LPG vessel was in a port where the shore gangway was not available and the ship was requested to provide the gangway. 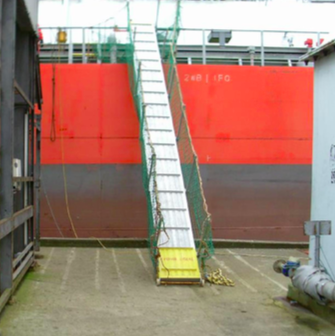 The OOW did not rig accommodation ladder as it appeared to him that there was no sufficient room for bottom end of ladder to freely move on the pier, instead the portable gangway (MOT ladder) was used. The OOW and deck crew failed to notice the steep angle formed by this ladder and overlooked the associated risk. The steep angle (around 50 deg) was because of vessel higher freeboard and low level of pier (please see attached). This unsafe arrangement was picked up by the terminal safety officer and led to a temporary hold on the vessel by an Oil Major. April 29, 2017, 10:08 p.m.
How far out should a ladder be from the wall? What are the Key shipboard operations?